St. Louis County is included in the Duluth, MN-WI Metropolitan Statistical Area. Major industries include pulpwood production and tourism. Surface mining of taconite and processing it into high grade iron ore remains an important part of the economy of the Iron Range. Parts of the federally recognized Bois Forte and Fond du Lac Indian reservations are in the county. This area was long inhabited by Algonquian-speaking tribes: the Ojibwe (Chippewa), Ottawa and Potawatomi peoples were loosely affiliated in the Council of Three Fires. As American settlers entered the territory, the Native Americans were pushed to outer areas. The Minnesota Legislature established St. Louis County on February 20, 1855, as Doty County, and changed its name to Newton County on March 3, 1855. It originally consisted of the area east and south of the St. Louis River, while the area east of the Vermilion River and north of the St. Louis River was part of Superior County. Superior County was renamed St. Louis County. On March 1, 1856, that St. Louis County was renamed as Lake County. 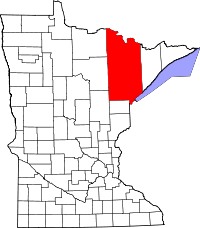 Newton County was renamed as St. Louis County and had that eastern area added to it; it was also expanded westward by incorporating parts of Itasca County, which then also included most of Carlton County. On May 23, 1857, St. Louis County took its current shape when Carlton County was formed from parts of St. Louis and Pine counties. According to the U.S. Census Bureau, the county has a total area of 6,860 square miles (17,800 km2), of which 6,247 square miles (16,180 km2) is land and 612 square miles (1,590 km2) (8.9%) is water. By area, it is the largest county in Minnesota and the largest in the U.S. east of the Mississippi River. Voyageurs National Park, established in 1975, is located in its northwestern corner, on the south shore of Rainy Lake on the Canada–US border; it is popular with canoeists, kayakers, other boaters and fishermen. The county also includes parts of Superior National Forest, established in 1909, and the Boundary Waters Canoe Area Wilderness on the border, established in 1978. The BWCAW is a 1,090,000-acre (4,400 km2) wilderness area designated for fishing, camping, hiking, and canoeing, and is one of the most visited wilderness areas in the United States. St. Louis County has more than 500 lakes, including Rainy, Kabetogama, Namakan, Sand Point, and Crane lakes. The largest lakes are Pelican and Vermilion. The "Hill of Three Waters" on the Laurentian Divide lies northeast of Hibbing. Rain falling on this hill runs to three watersheds: Hudson Bay to the north, the Gulf of Saint Lawrence to the east (via Lake Superior), or the Gulf of Mexico to the south and west (via the Mississippi River). The county is drained by the St. Louis, Vermilion, and other rivers. Duluth on Lake Superior is one of the most important fresh-water ports in the United States and located in this county. The county encompasses part of the Iron Range. It has had a significant taconite mining industry, particularly in the city of Virginia. The county has a humid continental climate (Köppen Dfb), slightly moderated by its proximity to Lake Superior. Winters are long, snowy, and very cold, normally seeing maximum temperatures remaining below 32 °F (0 °C) on 106 days. Due to global warming, in January 2019 Tracy Twine, professor at the University of Minnesota’s Department of Soil, Water and Climate, said "we just don’t expect temperatures to be below 10 degrees Fahrenheit in Duluth anymore. Public schools and other government offices shut down on January 29-30, 2019 because of wind chills of -70°F. As of the 2010 census, there were 200,226 people residing in the county. The racial makeup of the county was 94.0% White, 2.2% Native American, 0.4% Black or African American, 0.9% Asian, 0.2% of some other race and 2.3% of two or more races. 1.2% were Hispanic or Latino (of any race). According to the 2010–2015 American Community Survey, the ancestral makeup was 24.3% German, 15.9% Norwegian, 13.0% Swedish, and 10.2% Irish. As of the 2000 census, there were 200,528 people, 82,619 households, and 51,389 families residing in the county. The population density was 32 people per square mile (12/km2). There were 95,800 housing units at an average density of 15 per square mile (6/km2). The racial makeup of the county was 94.86% White, 0.85% Black or African American, 2.03% Native American, 0.66% Asian, 0.03% Pacific Islander, 0.22% from other races, and 1.35% from two or more races. 0.80% of the population were Hispanic or Latino of any race. 27.60% of households included children under the age of 18, 49.30% were married couples living together, 9.40% had a female householder with no husband present, and 37.80% were non-families. 31.20% of all households consisted of individuals and 13.00% of individuals 65 years of age or older. The average household size was 2.32 and the average family size was 2.90. The population spread by age was 22.40% under the age of 18, 11.40% from 18 to 24, 25.90% from 25 to 44, 24.30% from 45 to 64, and 16.10% who were 65 years of age or older. The median age was 39 years. For every 100 females there were 96.80 males. For every 100 females age 18 and over, there were 93.80 males. The median income for a household in the county was $36,306, and the median income for a family was $47,134. Males had a median income of $37,934 versus $24,235 for females. The per capita income for the county was $18,982. About 7.20% of families and 12.10% of the population were below the poverty line, including 13.10% of those under age 18 and 8.90% of those age 65 or over. Like all counties in Minnesota, St. Louis County is governed by an elected and nonpartisan board of commissioners. In Minnesota, county commissions usually have five members, but St. Louis, Hennepin, and Ramsey counties each have seven members. Each commissioner represents a single-member district of equal population. The county commission elects a chair who presides at meetings. In 2007, St. Louis County considered doing a study about dividing into two counties. This plan was abandoned. This county is one of the most reliably Democratic counties in the state, as no Republican or Independent candidate has won this county in any statewide election since 1992. The only time a Democrat obtained less than 50% of the vote was in 1998, when Jesse Ventura of the Reform ticket won statewide; some 24% of the county voted for him. Since 1992, the only time when a Republican obtained more than 34% of the vote was in the elections of 1994 (year of Republican Revolution) when the incumbent Independent-Republican governor won the statewide vote by a landslide of more than 60%, and when the Independent-Republican senatorial candidate won election with 49% statewide, both of which are rare occurrences in Minnesota. St. Louis County has long been one of the strongest Democratic bastions in the state outside of the Twin Cities. The Democrats have carried the county for 20 consecutive presidential elections. The last Republican candidate to carry the county was Herbert Hoover in 1928, before the Great Depression. In recent elections, Republicans have received about 1/3rd of the county's vote. In 2016, Donald Trump earned 39.7% of the county's vote, while the Democratic vote deteriorated to 51.4% (the lowest percentage since 1932); according to exit polls, this was due to residents' concerns about the decline of mining and forestry in the county. This was the closest that a Republican had come to winning the county since 1972. St. Louis County is in Minnesota's 8th congressional district. For many years it was represented by Democrat Jim Oberstar, but in 2010 he was defeated after 36 years by Republican Chip Cravaack. Two years later Cravaack was defeated by Rick Nolan, a member of the Democratic Party, who is the current Representative of the 8th district. ^ Chicago and North Western Railway Company (1908). A History of the Origin of the Place Names Connected with the Chicago & North Western and Chicago, St. Paul, Minneapolis & Omaha Railways. p. 164. ^ Duluth News Tribune September 22, 2004, p. 2B. According to the U.S. Census Bureau, Aroostook County, Maine has a smaller overall area but a greater land area. ^ "2010 Census Gazetteer Files". United States Census Bureau. August 22, 2012. Archived from the original on September 21, 2013. Retrieved October 25, 2014. ^ a b Ripley, George; Dana, Charles A., eds. (1879). "Saint Louis. I. A N. E. county of Minnesota" . The American Cyclopædia. ^ "7 km NE of Hibbing, Minnesota, United States 7/1/1983". Microsoft Research Terraserver. USGS. Archived from the original on October 25, 2012. Retrieved June 17, 2011. See USGS map sheet "Hibbing Quadrangle", Minnesota-St. Louis county, 7.5 minute series, the "three-way watershed" marker is located at a spot on the hill about 375 meters south of the truck shop on the property of Hibbing Taconite Iron ore mining company. ^ Jennifer Bjorhus (16 January 2019). "U scientists: Minnesota is one of the nation's fastest-warming states". Star Tribune. Retrieved 30 January 2019. said Tracy Twine, an associate professor in the University of Minnesota’s Department of Soil, Water and Climate. “We just don’t expect temperatures to be below 10 degrees Fahrenheit in Duluth anymore,” Twine said. ^ "Weather-related closings and cancellations for this week". Duluth News Tribune. 29 January 2019. Retrieved 30 January 2019. Duluth Public Schools - closed Tuesday and Wednesday. ^ "2015 American Community Survey". ^ Dave Leip's Atlas of U.S. Presidential Elections. Uselectionatlas.org. Retrieved on July 12, 2013. ^ St. Louis County considers a split | Minnesota Public Radio News. Minnesota.publicradio.org (July 30, 2007). Retrieved on 2013-07-12. ^ "Presidential election of 1928 - Map by counties". geoelections.free.fr.